Walkability is excellent shorthand for good urban design. For a city to encourage walking, it must have a dense mixture of land uses, integrated with streets and open spaces, all designed for people. Walkable places are comfortable, convenient, healthy and sustainable, but they can be very difficult to achieve — especially in suburban environments that were designed for driving. This website presents successful case studies where new development has established dense, walkable, transit-supportive urban districts. Rather than downtown or big-city settings, we emphasize projects that have introduced a more urban pattern from the ground up — often by redeveloping suburban areas that were originally built around the automobile. Sometimes referred to as "suburban retrofits," these projects have common challenges — from street standards to market expectations to phasing. This site is intended as a resource for planners, developers, city officials, advocates and civic leaders who want to effect change in their communities. All too often, we hear about how this type of transformation is too ambitious, how it "can't happen here." Indeed, the obstacles can be formidable. But with strong leadership, smart investment and sound planning principles, it can be done — as these examples from around the country illustrate. 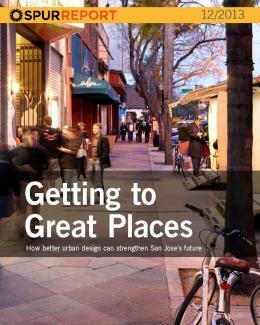 This effort is an outgrowth of Getting to Great Places, a 2013 SPUR policy report aimed at improving the urban design quality of new development in San Jose, California. San Jose has charted a vision of an urban, walkable future, and SPUR is working to support its successful implementation. While the report is aimed at San Jose, the issues it tackles are relevant to many cities that are retooling suburban areas for livability, sustainability and economic competitiveness.